“The PHP Framework For Web Artisans” is quite a bold statement to make, but Laravel might just accomplish it’s goal of being the best PHP framework out there. Laravel is extremely powerful when it comes to making online applications and honestly it’s not that hard to use either. If you’ve ever used Ruby then you would feel right at home with Laravel. 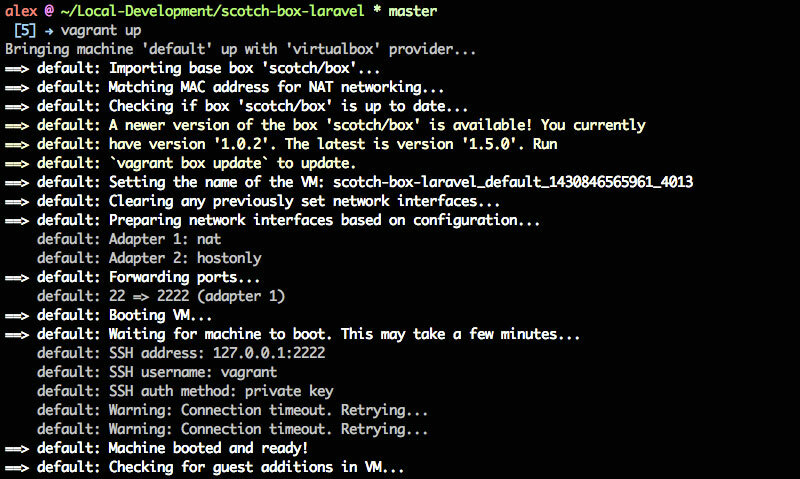 Some of you reading the title may be wondering why I’m bothering how to go through and setup Laravel on Scotch Box, after all Laravel has it’s own official Vagrant box called Homestead. The main reason is simply because I don’t want to mess around with two Vagrant Boxes – I would rather just use one box that I’m super familiar with so that I know all the ins and outs of it. I am first and foremost (because I get paid to do it) a WordPress developer. 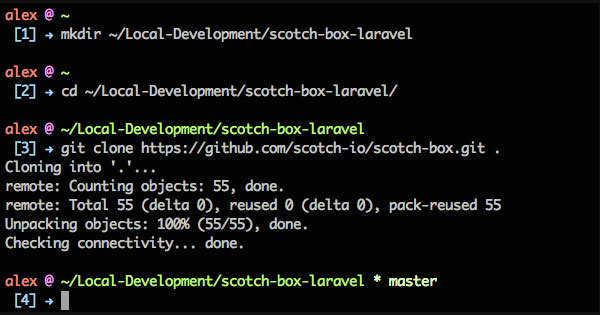 The Scotch Box is great for WordPress development (I already have a blog post for how to setup the Scotch Box for WordPress development) but it also has Laravel built into it, so that’s what I choose to use so I can use the same box for both. This way I know the layout of the file system and how everything works no matter what I’m working on. To play my own devil’s advocate; lots of the “power” of Vagrant comes from the fact you can use multiple boxes for different situations. You can have one box specifically designed for WordPress that requires no setup, then another for Laravel, and another for Ruby on Rails. If that’s what you choose to do there’s detailed instructions on the Laravel site for setting everything up with Homestead and I will totally understand you’re point of view. If you’re still with me, let’s get started. Before you can get started with any of that you have to install Vagrant itself as well as Virtual Box (or some equivalent that works with Vagrant, but Virtual Box is the most supported so I would go with it). Both of these are a simple download and then install from the downloaded file – there’s no technical trickery required. Just a note, if you like my terminal you can find an entire article I did on the Customizing Your Terminal which contains the aesthetic changes I made to iTerm as well as a copy of my .bash_profile file. If you are interested in that then please feel free to check that out. There’s a few more lines at the bottom but you get the idea. If you have a problem where you keep getting Connection timeout. Retrying… over and over for a long time, check this Stack Overflow Question for a possible solution. Once you’re machine is booted up and ready though you should be able to access it at http://192.168.33.10/. 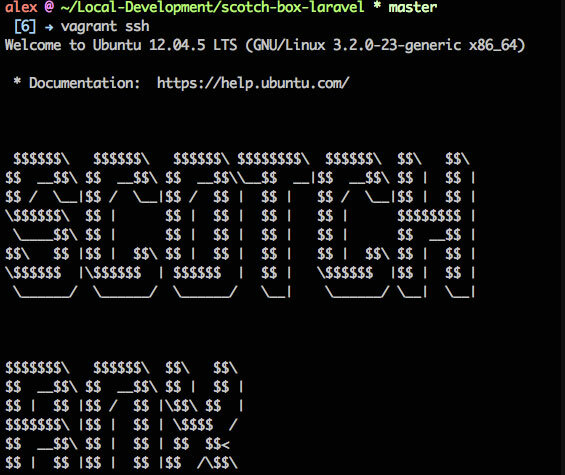 If you see the splash page – congrats you have Scotch Box up and running! That’s it – once the changes have been made to index.php you should be able to visit http://192.168.33.10/ and see the splash page for Laravel. Needless to say if you saw how we setup the file paths you should know that this isn’t the only configuration you could use – you’re app could actually go almost anywhere and then you just point to it. I just like keeping in where I can easily access it through my local file system. In the future I would love to cover more stuff about Laravel so look out for some tutorials/articles about that.